As a part of the collaborative MSEIP grant with BMCC (funded by the Department of Education) we have funds in the City Tech budget to support undergraduate student research projects to be conducted over the summer. We have $42000 in the City Tech budget to recruit 28 students for summer research projects, along with their faculty mentors. Each faculty mentor is expected to develop appropriate undergraduate research projects and can advise up to 2 students. The faculty can recruit the students directly but if they need help recruiting students, they can contact me. 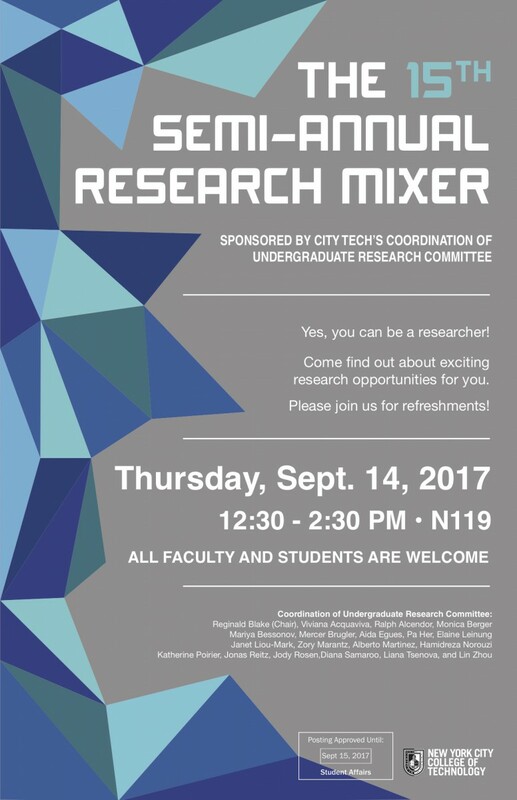 Each student researcher will receive $1000 stipend upon successful completion of the summer research project, which will involve giving a short presentation at a local conference (either at City Tech or BMCC). Each participating faculty mentor will receive $500 in summer salary for each student they supervise. Faculty and student applications are due by April 24. Please let your students know about this summer research opportunity, and if you are interested in advising students, please let me know and we’ll go from there. Below you will find additional guidelines regarding international students. Please note that interested students must meet the guidelines in either A or B described below. A. US citizens or Green Card holders (permanent residents) are eligible to receive a student stipend. Yes, you can be a researcher! Come and find out about exciting research opportunities for you. The Emerging Scholars Program provides a $500 stipend for full-time students (enrolled for 12 or more credits) and a $250 stipend for part-time students (enrolled in 11 or fewer credits) for conducting research with a faculty member. The purpose of the program is to provide students with an opportunity to apply what was learned in the class room to discover new knowledge, to solve real-world problems and to develop professionally while working with faculty to advance scholarly endeavors. 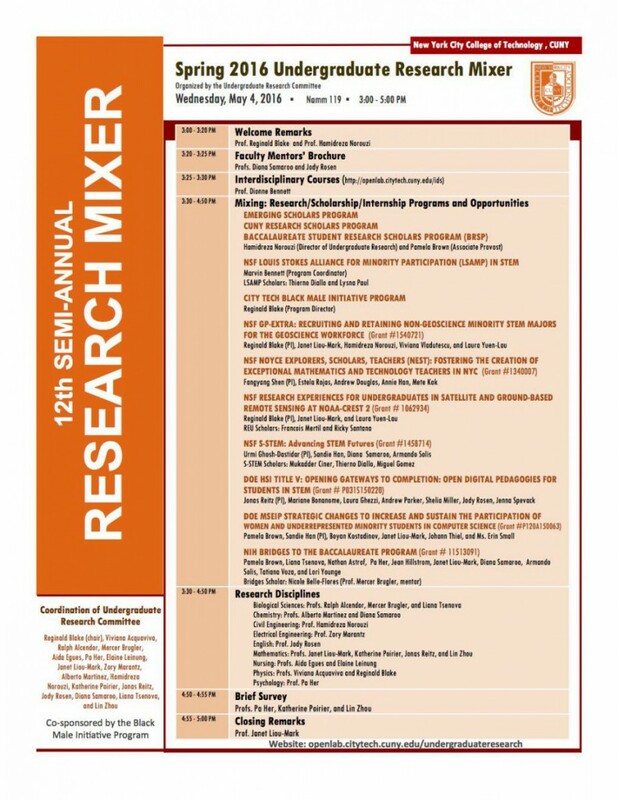 The program includes specially designed workshops offered by the Honors Scholars and other programs and participation in a biannual poster session. If there is a student that you would like to work with, please provide them with this information and encourage them to apply. Parts IIA (link) and IIB (link) of the application include: (1) PREA, (2) CUNYfirst Expense Reimbursement form, (3) W-9 and (4) Consent forms. (4) Consent form – Both the student and mentor must print and sign. Faculty mentoring multiple students should only submit one copy. (5) An unofficial copy of the student’s transcript, including Spring 2017 registration. 1. Undergraduate researchers are expected to attend the mandatory orientation meeting on Thursday, February 23, 2017, from 12:45-2:00 PM in Namm 1001 (To be confirmed). and submit their Collaborative Institutional Training Initiative (CITI) certificate by Thursday, March 23rd, 2017to Ms. Chioma Okoye, Provost’s Office, Namm 320, Phone – 718.260.5560 OR email:undergraduateresearch@citytech.cuny.edu – SUBJECT LINE: CITI certification. Even if you have submitted this in previous semesters, you are still required to submit a copy of the certification. 4. 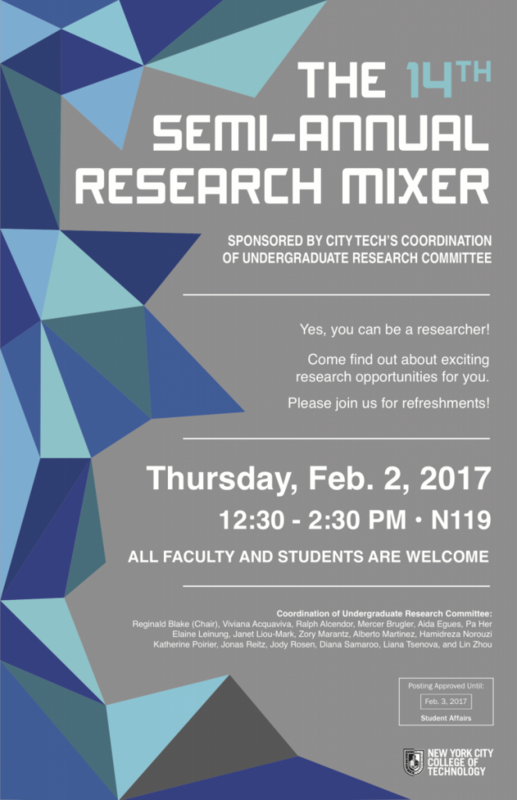 Attend the spring 2017 Research Mixer sponsored by the Undergraduate Research Committee. Date February 2nd, 2017 12:30-2:30 PM at Namm 119. 5. First-time undergraduate researchers must attend the four Group I workshops. Returning researchers must complete four workshops from Group II. If you have already completed all of the Group I and II workshops and do not wish to participate in them again please contact Prof. Hamid Norouzi @ undergraduateresearch@citytech.cuny.edu–SUBJECT Line: workshop alternatives, to discuss alternate activities to fulfill this requirement. Additionally you should prepare your poster based on your final results for a poster session event. The poster file must be uploaded to the following Dropbox link by Wednesday, April 26th, 2017. Signing the consent form indicates permission to publish abstracts and posters on the college website. 7. Be a full-time student in good academic standing (exceptional part-time students are eligible for a $250 stipend for 25 hours of work with their mentors and attend all workshops). scholarly work, Emerging Scholars are limited to ONE research project per semester. Undergraduate research stipends are not available to those receiving stipends from another project although they may participate in the program. Faculty mentors involving multiple students on a project should distinguish the expected roles to be performed by each student on the Pre-Research Application (PREA). *Due to restrictions in funding, students must be US citizens or permanent residents (they must have a social security number) to receive the stipend. They must be recommended by a faculty member into the program, and be in good academic standing, i.e. not placed on academic probation. In order to be paid, a W-9 and Reimbursement Request forms must be completed and submitted with the rest of the application. Allow 6-8 weeks for processing the stipend payments. To ensure timely delivery, please verify that the college has your correct address on file. At the Awards Ceremony, you will receive a certificate for your accomplishments. If you have any questions, feel free to e-mail Prof. Hamid Norouzi (undergraduateresearch@citytech.cuny.edu). Thank you for considering this opportunity for our students. Hamid Norouzi, PhD , P.E. The Office of the Dean for Graduate Education at the Massachusetts Institute of Technology will host its annual MIT Summer Research Program (MSRP) from June 10 – August 11, 2012.